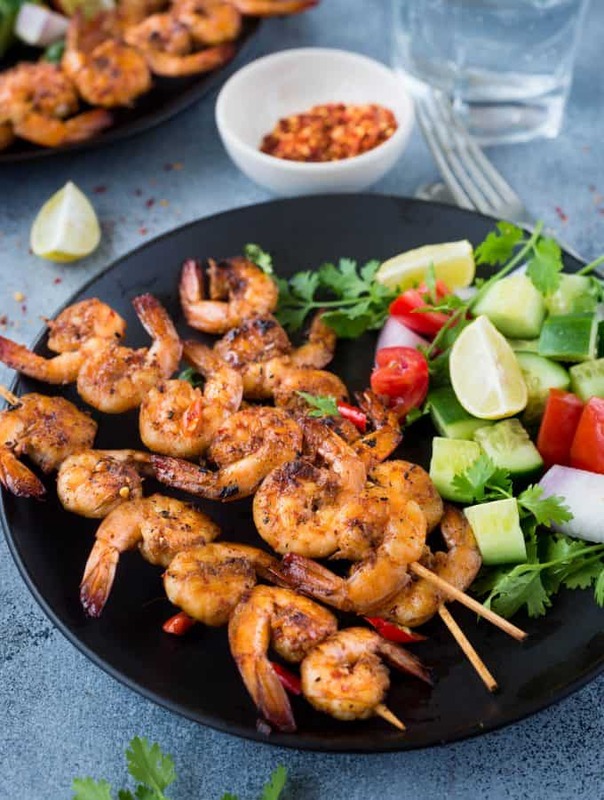 Vietnamese Grilled Shrimps are Shrimps marinated in lemongrass, fish sauce, spices and grilled till golden brown. 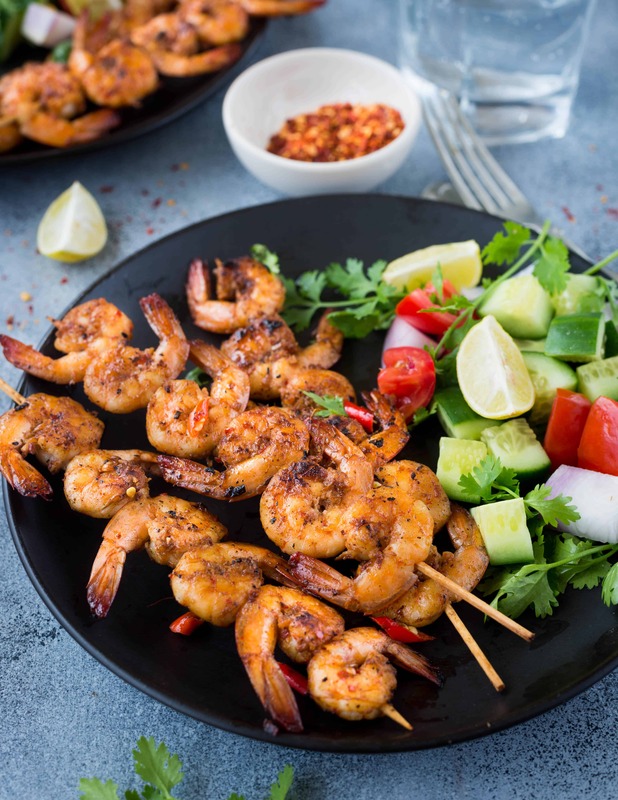 Refreshing lemon flavour, pungent fish sauce and aromatic spices make grilled shrimps so delicious. 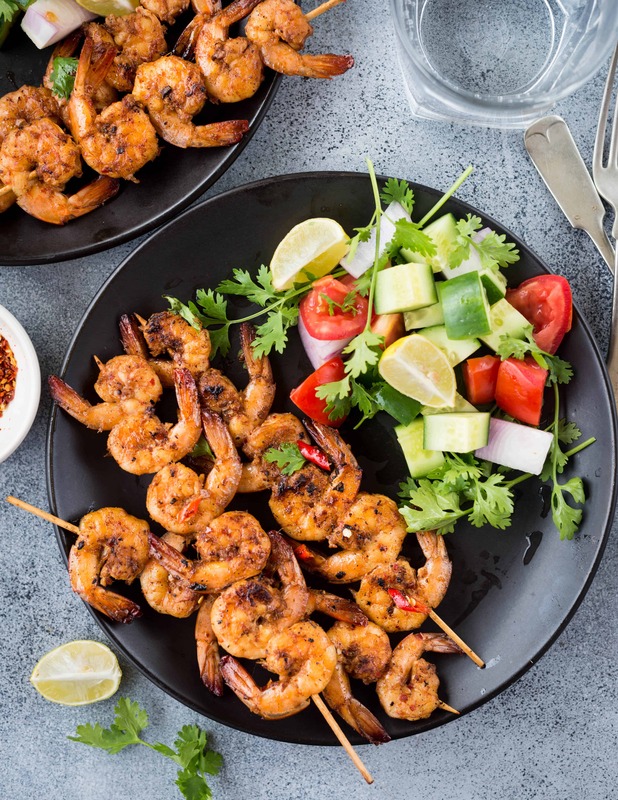 Grilled Vietnamese Shrimps are so easy and quick to make. It is a great appetizer and can easily be served to a large crowd. The best part is it takes 10 minutes of prep and 5 minutes to grill these shrimps. A few days back while browsing I stumbled upon this article which beautifully explains the Vietnamese cuisine. When it comes to Vietnamese cuisine, all I can think about is the refreshing rice paper roll with sweet and spicy peanut sauce, that amazing creamy Vietnamese coffee or comforting Pho ( noodle soup in an aromatic broth). But after reading the article I got to know there is much more in Vietnamese cuisine. The layers of flavour, usage of fresh herbs and the way food is influenced by its geography from north to south. When few of my favourite ingredients are part of a cuisine, I knew I had to make something inspired by Vietnamese flavours. 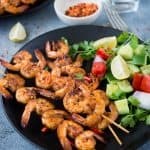 How to make Vieatnamese Grilled Shrimp? First, let’s take about the Grilled Shrimp Marinade. The marinade has ginger, garlic, lemongrass as main ingredients. There is honey to give a hint of sweetness. And then a touch of fish sauce, for that Asian touch. Try to use fresh ingredients for the marinade. I minced some fresh lemongrass stem in this recipe. Once the Marinade is ready, it is optional to marinate the shrimps. If you are short of time, you can directly grill them. Else marinate the shrimps for 30 minutes and then grill. I prefer to keep the tail on for extra flavour and crunch. Now the important part how to grill the shrimps. It is very important not to overcook the shrimps. When shrimp are overcooked, they turn rubbery and dry. 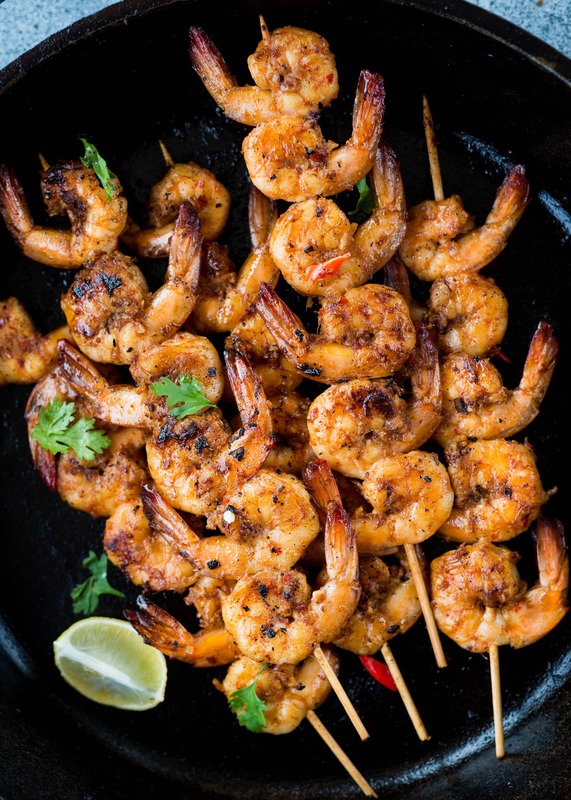 Cook shrimps directly on the grill. Depending on the size of the shrimps, it might vary fro 3-5 minutes per side. Another way of grilling shrimp is on a grill pan, on the stovetop. Lightly grease the grill pan and cook each side on medium high heat for 2-3 minutes each side. You can also bake the shrimp in a pre-heated oven at 400 degrees for 6-8 minutes. Serve a simple refreshing cucumber salad on the side. How about this RICOTTA PASTA SALAD or VEGAN MACARONI SALAD? 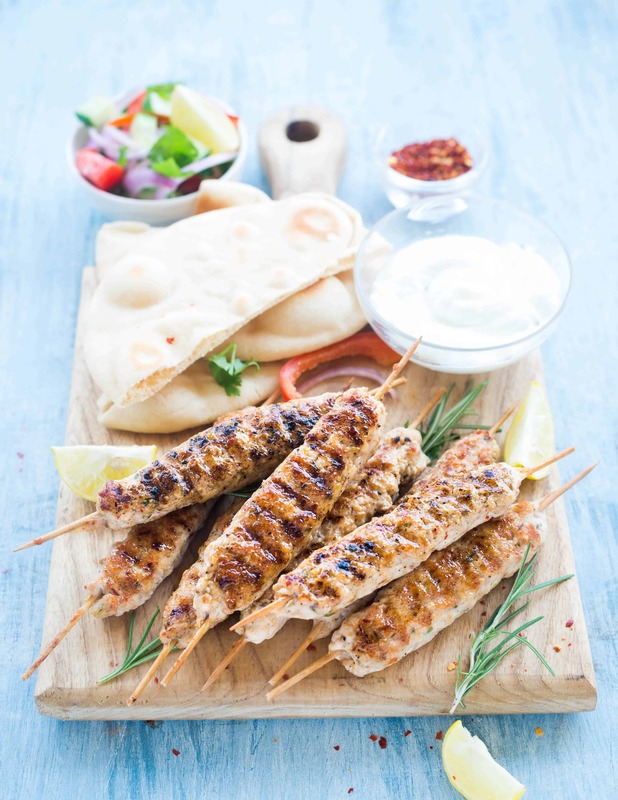 Looking for some amazing Summer barbecue recipes? Mix all the ingredients mentioned above. Add the cleaned prawns. Marinate at least for 30 minutes. Prepare the grill pan or barbecue by brushing some oil on it. Carefully skewer the prawns. And grill each side for about 3-4 minutes. Blast in between with the remaining marinade to keep the prawns moist. While serving garnish with fresh coriander leaves. 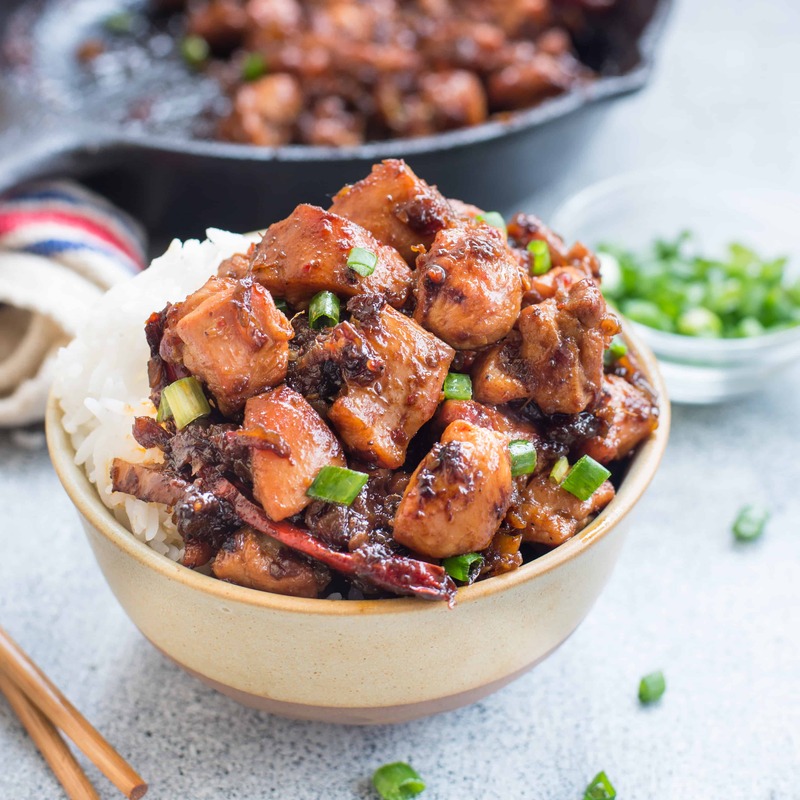 Quick Chinese Five Spice Ginger Chicken is Sweet and Spicy with perfectly caramelized sauce. Easy, quick and you only need one pan. The caramelized onion and sauce in this recipe is to die for. I and D literally fought for the residue sauce in the pan. The sticky sweet and spicy sauce coated chicken very well. You can taste the awesome sauce in every bite of yours. It pairs really well with rice. 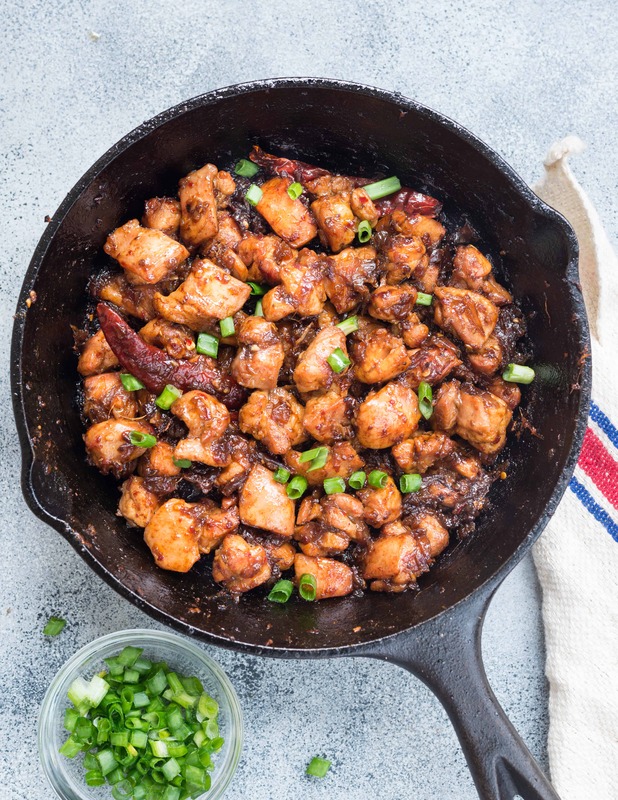 I always try quick stir-fry recipes, which would take less time, need one pan and easy to do. I love Asian stir-fries a lot because of the all the aromatics and sauce it uses. You can adjust the seasoning and sauce as per your preference. I have shared quite a few stir fry recipes on my blog. I guess its time to tell you a little about Stir-fry. 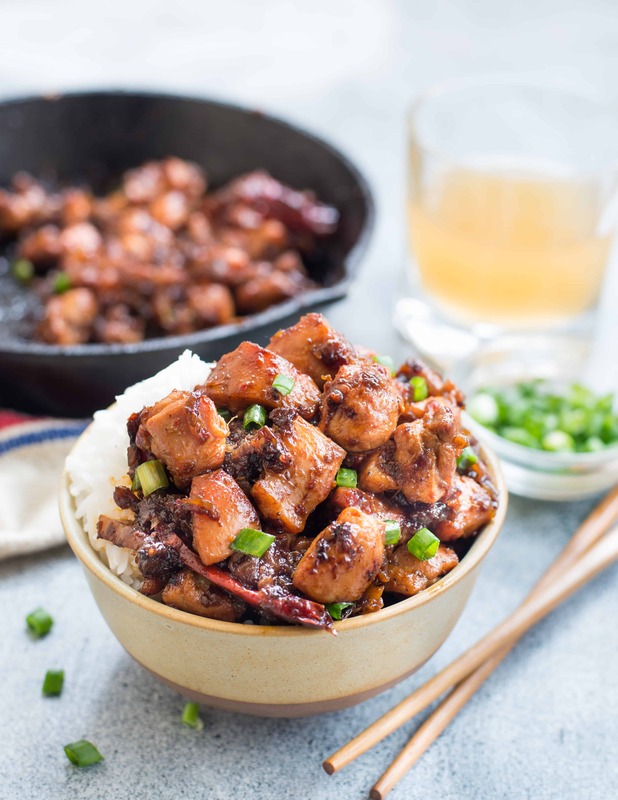 Stir-frying is a cooking technique that originated in China.It involves quickly cooking vegetables, meat, and sauces in a small amount of oil. Traditionally a big wok is used for stir-frying. Cooking on really high temperature quickly makes sure the original flavors and texture of the food is maintained. The vegetables in a stir fry are tender but crisp. Overcooked, mushy vegetables in a stir-fry is a complete no-no. In restaurants, where they use a wok and stir-fry on a really high flame, lends a smoky flavor to the dish. While practically it is not possible to do the same. Most of the time I use my cast iron pan which gets heated to really high temperature and helps in quick cooking. How many of you like ‘Chinese Five Spice’? I absolutely love the warmth of the spices and the depth of flavor. As five-spice blend is not readily available where I live, I make my own following this recipe. 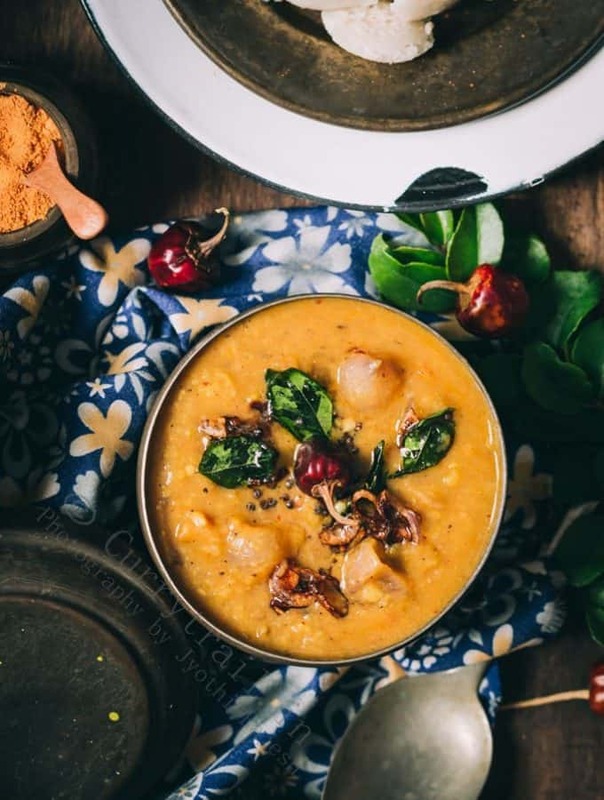 I usually have all the ingredients mentioned in the recipe and I make a fresh batch in small quantity in a mortar and pestle. If you get ready-made spice blend then use it. Five-Spice is very strong, so adjust the quantity accordingly. I have used Chicken thigh in this recipe. I don’t have to tell how juicy chicken thighs are. It works really well in this recipe. Because we are going to caramelize onion, sauce and the meat chicken thigh is the best choice. You can also use chicken breast but need to be careful while cooking. In a wok or large frying pan add Oil. Once the oil is hot add dry red chili followed by chopped onion. Saute onion in medium heat till they look soft and start to brown. Add minced Garlic,Grated ginger,honey,Soy sauce,five sauce. Mix and cook for 1-2 minutes. Add chopped chicken thighs. Mix well. Cook on medium-high heat till the chicken is cooked and well coated with the sauce. Season with Fish Sauce, Salt, and pepper. Mix everything well and cook for another 30 seconds. By now the sauce must have been nicely caramelized and sticky. While serving garnish with chopped green onion. Crispy Fried Chicken Tenders are amazingly Crispy outside and super juicy from inside. 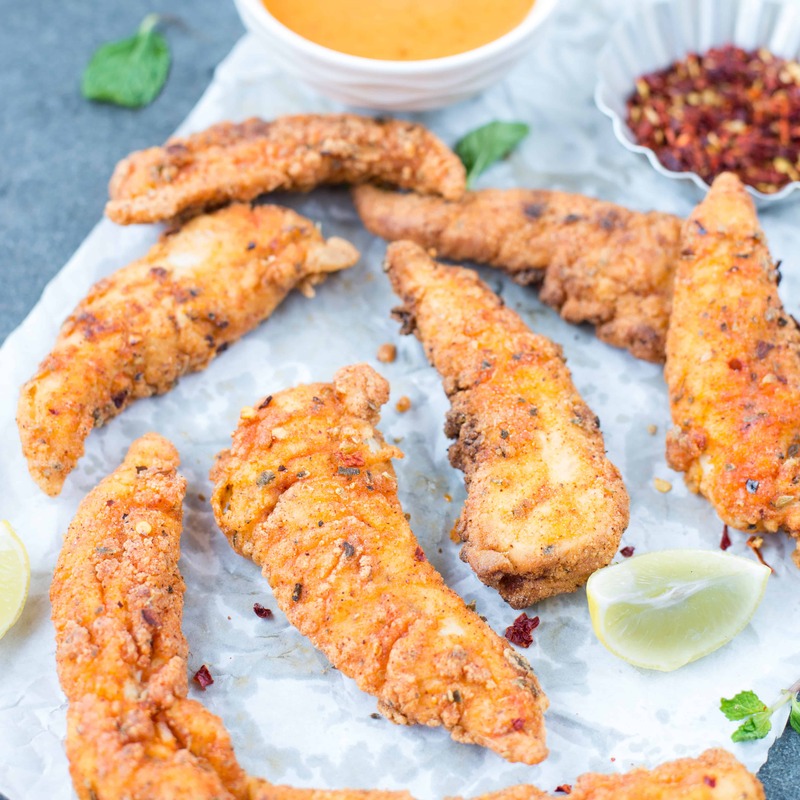 It is dairy free and Gluten free.Let’s learn how to make Crispy Fried Chicken Tenders here!! 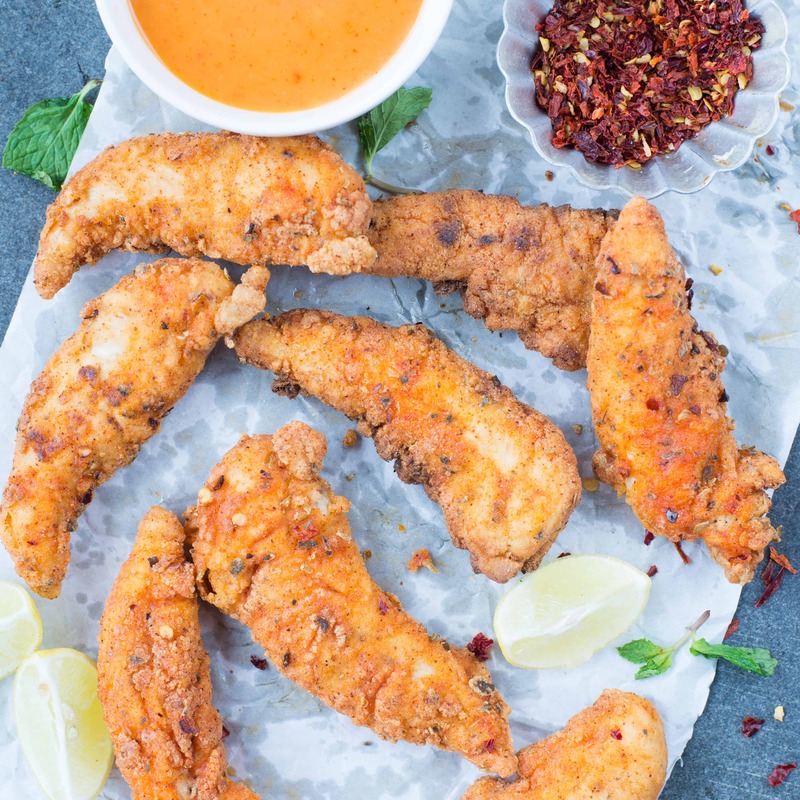 Crispy fried chicken tenders are always a crowd pleaser. These chicken tenders are well seasoned and really crispy on the outside. We have made it a lot of times, so I can say these are well approved by everyone at home. When you pair it with a dip, the combination is sure to die for. When everyone is switching from fried to baked version, you must be wondering why am I praising this fried one so much. 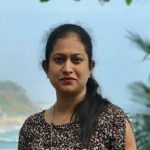 It’s been raining here in Bangalore and gloomy. When it rains all we can think about is something fried. We really won’t feel like preheating the oven and wait for another 30 – 45 minutes to get things ready. Got the point now ?? 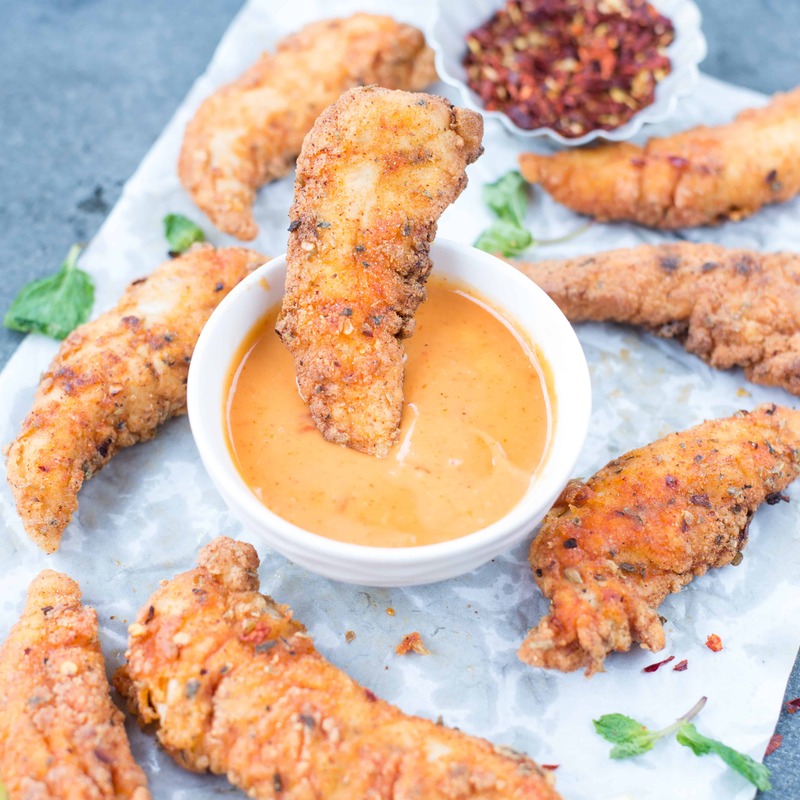 So even though I make baked chicken a lot but when you are in a hurry or you are craving for some fried chicken tenders this version is the answer. There are numerous ways of making fried chicken and I am sure you must be having one of your favorites. 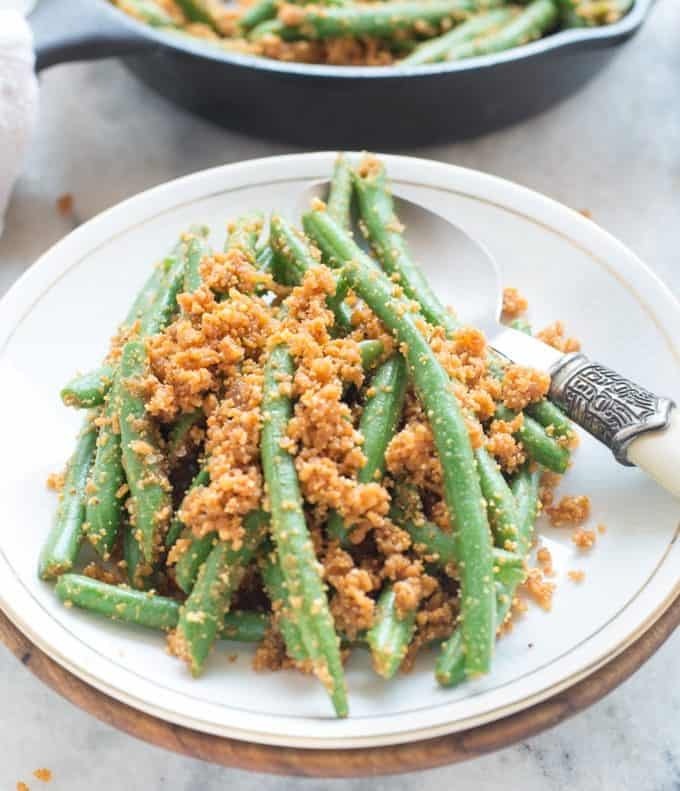 You would find recipes that call for marinating in buttermilk then followed by coating in Panko bread crumbs. Then there are few in which you dip chicken into egg mixture then followed by dipping in flour and bread crumbs mixture. I have tried both the types and they come really good. Now coming to this version, I felt this one is less fussy. I have used lemon as tenderizer instead of buttermilk. For coating, I have used a mixture of cornflour and rice flour. So it is gluten free. I have seen my mom using rice flour while deep frying. Rice flour gives very nice crunch to the deep fried stuff. She uses a mix of chickpea flour and rice flour as a batter mixture. I have also used corn flour for making it extra crispy. I have used chicken tenders here. 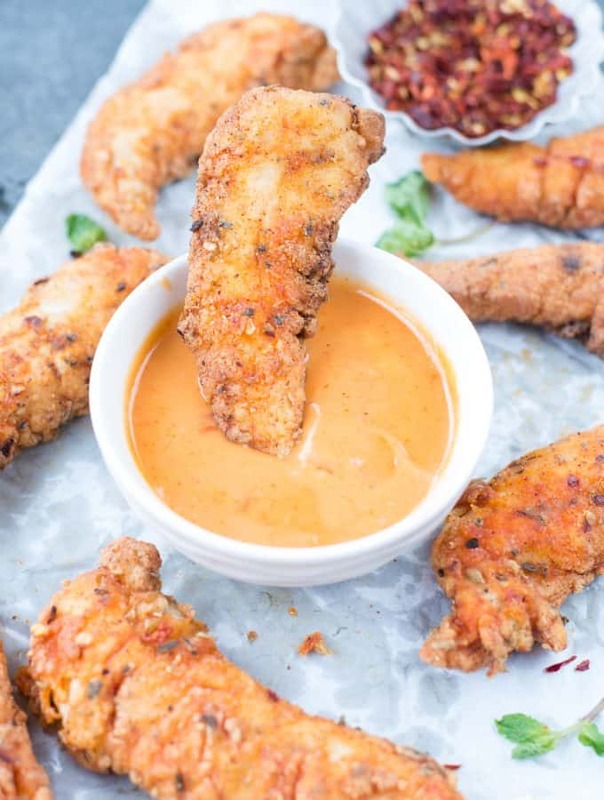 If you wonder what exactly is Chicken tenders then refer to this article from thekitchn. Crispy Fried Chicken Tenders are amazingly Crispy outside and super juicy from inside. Mix all the ingredients mentioned under marination. Cover and let it rest for at least 30 mins up to 4-5 hours. If the Chicken is refrigerated , Take it out before frying and allow it to thaw completely. Mix all the ingridents mentioned under cornflour mixture. Make the coating. Heat just enough oil for shallow frying. The oil should be just medium-hot. Shallow fry the coated chicken tenders for about 3-4 minutes in medium heat, turning in between. 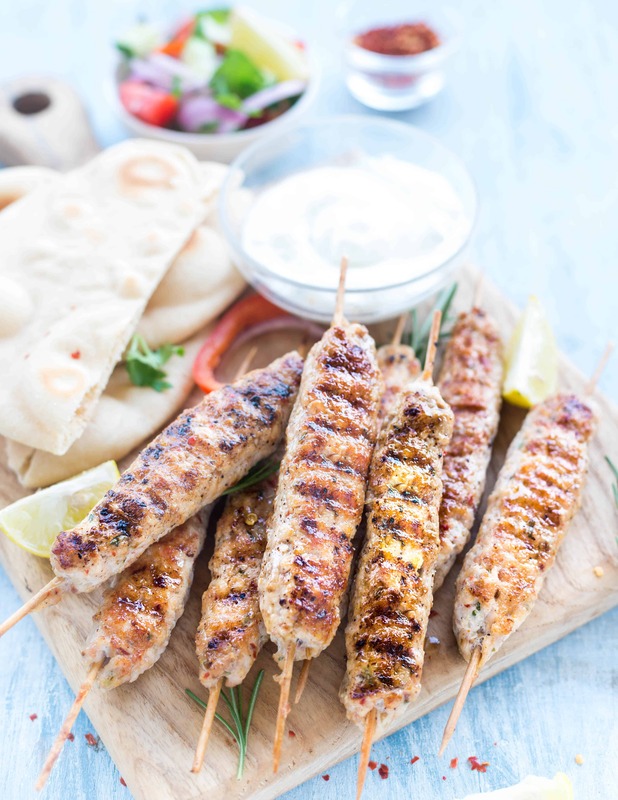 Grilled Rosemary Chicken Kebabs are a great addition to your appetizer menu and perfect for you outdoor summer grilling. Made with just few ingredients this Rosemary Chicken kebabs are juicy and full of flavors. Now a days I am trying to reduce my carbs intake and incorporate more protein in my diet. So mostly my dinner is grilled chicken and veggies. And to keep myself motivated I am trying out different marinades for the Chicken. Whereas my go to marinade is a spicy Indian masala, sometime I prefer to keep the flavors simple. Adding fresh herbs to the marinade makes a lot of difference. These grilled rosemary chicken are also good as a warp stuffing. 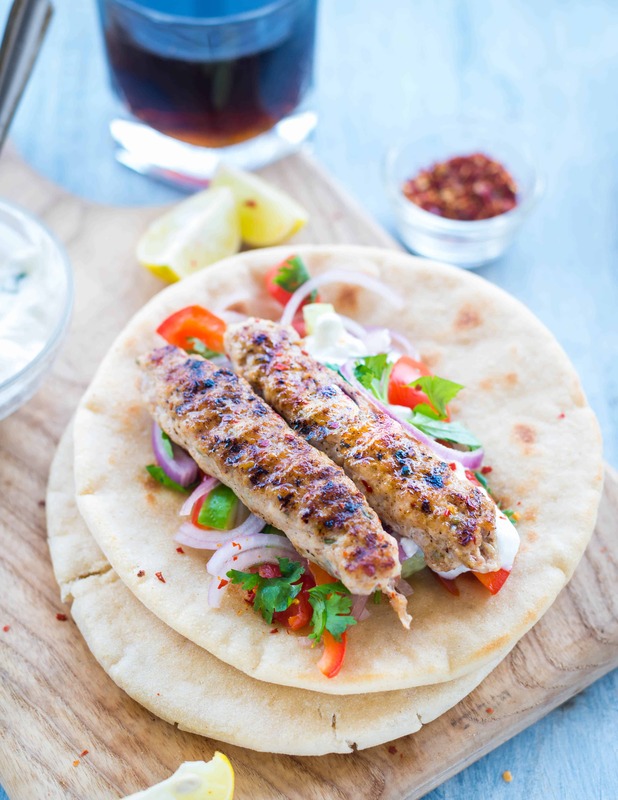 I had these with some fresh salad while rest at home had these stuffed in pita bread. There was also some garlic yogurt dip to go along with the kebabs. Soak the wooden skewers in water for 10-15 minutes. This is to prevent the skewer from catching fire while grilling. Drain extra water if any from chicken mince. Squeeze extra water from grated Onion. Add all the ingredients (except oil for grilling) in a bowl. Mix everything well using hands. Make your hand slightly wet.Take small balls of above chicken mixture. Skewer the mixture onto the wooden skewers. If using a grill pan then brush generously with oil and grill for 4-5 minutes, rotating in between. If grilling on a barbecue, then grill till the kebabs are cooked through. Blast with oil a couple of times in between. Serve hot with fresh salad, garlic yogurt dip or use it as a stuffing with Pita.